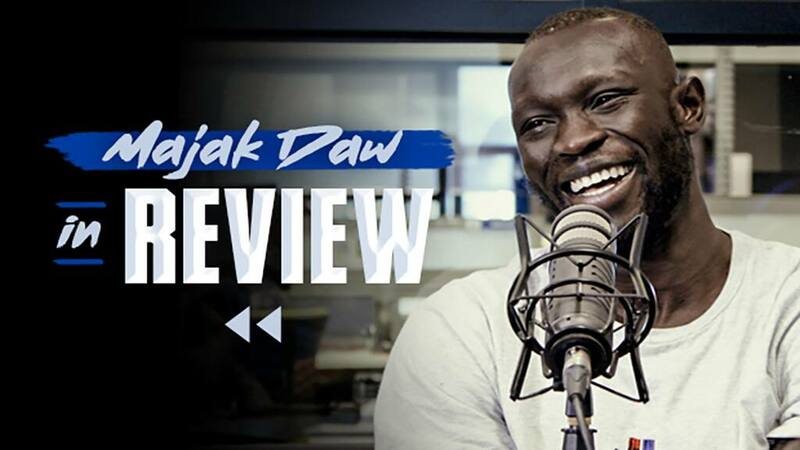 Majak Daw has taken another huge step in his rehabilitation, running over-ground for the first time. 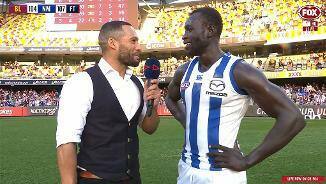 The first Sudanese-born AFL footballer, Majak Daw moved to Australia with his family in 2003. Attending secondary school at MacKillop College in Werribee, it was where Daw first played football. Daw played for the Western Jets in the TAC Cup, turning in some impressive performances in 2009. Draft camp results in the beep test, 20 metre sprint and standing jump caught North Melbourne’s eye. In the rookie draft, the Kangaroos selected him with their second pick, creating history. 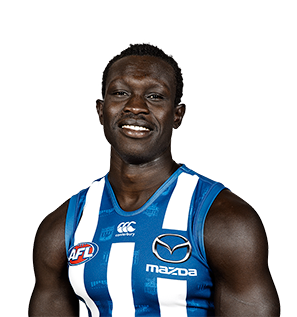 Majak Daw took the AFL world by storm, following a brave decision by the North Melbourne coaching staff to train him as a defender after years as a ruck/forward. Playing his first game of the year in Round 3 against Melbourne, Daw’s strength and athleticism made him a formidable force in North’s backline for the remainder of the season. Alongside the likes of Scott Thompson, Robbie Tarrant and Jamie Macmillan, Daw quickly became one of the best intercept marks in the game thanks to his strong hands and impressive jump. Nominated for Mark of the Year on two occasions, Daw still managed to make the highlight reels as a defender, taking high-flying grabs and laying big bumps on countless occasions. The 27-year-old played a personal best 18 games in a season, averaging 5.3 marks per game, the most in his AFL career. 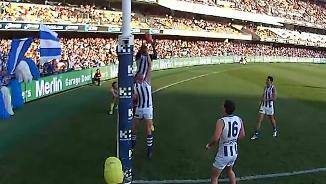 Daw’s 2017 AFL season was highly interrupted, by both injury and form. 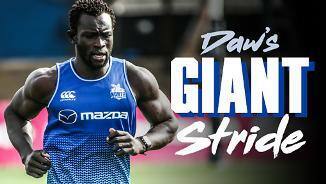 After suffering a concussion at training in the build up to round three, Daw was out of the senior side until a recall in round 14. He managed just seven games in 2017, not having the effect that he would have desired on the team and its results. There were positives though, with Daw spending more time in the ruck he won a career high 16 hit-outs per game. “Not many blokes can say they’ve kicked four (goals) in a final, and Maj has done that now. “The expectation probably rises now a little bit, but the biggest thing for Maj is that he hasn’t had a lot of pre-seasons. “You do a lot of your learning and a lot of your practicing of your technique in the pre-season. “Because he’s had so many injuries, he’s only had one or two pre-seasons in the time he’s been here. “The fact he can come back fresh this year and really smash a pre-season means the sky’s the limit for Maj.
Having dislocated his foot at the end 2014, Daw had a delayed start to his campaign. Daw had a strong run at form at VFL level and ultimately earnt his spot back as a result, playing his first AFL game for the year in round 14 against Gold Coast. Given another opportunity to prove himself in Round 23, he impressed in the ruck, one-out against Ivan Maric in the absence of Todd Goldstein. Daw was delisted ahead of the 2015 National Draft, but the club committed to re-adding him to the list as a rookie in December. Daw had an interrupted pre-season, recovering from a knee injury which curtailed his 2013 campaign. However, his early season games for Werribee were promising and earned him a North Melbourne call-up for the trip west to face Fremantle in Round 6. The key-position forward was promising in patches, kicking a goal and providing ruck relief for Todd Goldstein in the Kangaroos’ win. Five consecutive games in the side yielded three wins and two losses, but a quiet game against Richmond in Round 12 led to Daw being substituted at half-time and a stint in the VFL. Further strong performances for Werribee and praise from its coach John Lamont led to a recall for two more senior games in Round 18 and 19, but Daw was largely ineffective in both losses. Ben Brown effectively took his spot in the side from there and into the finals. It was playing for Werribee where Daw suffered what looked to be a horrific injury. It looked like he would be sidelined for 12 months, but luckily he escaped the most serious diagnosis. Dodging surgery, Daw should return to training in January after recovering from a dislocated foot. “We can certainly see that he can do some special things. Athletically and skill wise he’s suited to the game no problem, and that’s not what is going to hold him back. On his return to Werribee in the VFL, Daw was a consistent player in both the forward 50 and the ruck. Forming a solid partnership with Daniel Currie, Daw had multiple bags of goals. Unfortunately a troublesome knee injury forced a premature end to his season and he underwent surgery which ruled him out for months. Daw was suspended indefinitely in the pre-season for lying to the coaching staff about his rehabilitation from a knee injury. On his return he continued his development at Werribee, adding more consistency to his game when coming up against AFL-listed opponents in the ruck. He finished the year with arguably his best game of his career in the VFL preliminary final against Geelong and was promoted to the senior list for 2013. Even though Daw spent the year in the VFL, he was the talk of the town after an incredible goal against Collingwood. With more than 70,000 views on YouTube, it became a viral sensation. He played a full season as the number one ruckman in Werribee's seniors which provided an immeasurable boost to his development. He re-signed until the end of 2013 in October. Starting from a long way behind the rest of the list in terms of fitness, Daw's first 12 months were all about bringing him up to speed. 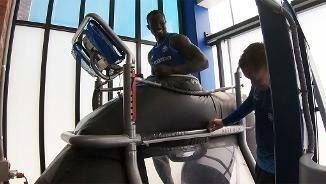 The fact wasn't lost on Daw either who said, 'I have to work on my fitness' after only six weeks at the club.